The key difference between Windows Phone OS 7.1 and Windows Phone 8 Tiles is that Windows Phone OS 7.1 offers only one Tile template. This template is called TileTemplate5, and maps to the flip template in Windows Phone 8. TileTemplate5 is only available in one size, which maps to the medium size in Windows Phone 8. 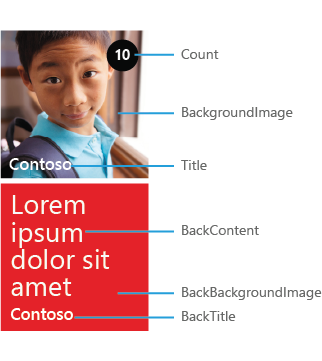 The following image shows the API name associated with each aspect of the Windows Phone OS 7.1 Tile template. 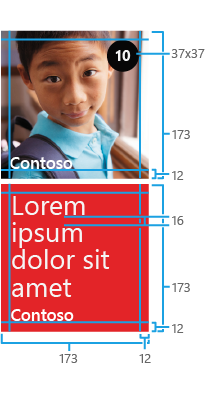 The following image describes sizing info for the Windows Phone OS 7.1 Tile template. For more info about how to design a great looking Windows Phone OS 7.1 Tile, see Flip Tile template design guidelines for Windows Phone. For more info about how to create, update or delete Windows Phone OS 7.1 Tiles, see How to create, delete, and update Tiles for Windows Phone OS 7.1.